I am writing this post on Saturday afternoon and we’re about to leave to go to a cocktail party at the home of my former sister-in-law. Former, as in, she was married to my first husband’s brother. I haven’t seen her in about 20 years but we’ve been in touch on the facebooks and she invited us to this party to celebrate their home renovation and, we’re going. I’m excited and maybe a little nervous. Mostly, though, I’m really looking forward to seeing her again as we were pretty good buddies when we were in the family together. As I recall, they referred to us as “the outlaws” instead of the inlaws. That should give you a pretty idea about why we bonded back in the day. None of that has anything to do with Sunday supper except for the fact that I’m using it to fill up blog space since I don’t know what we’ll be having for Sunday supper this week. There’s no football game to plan around (it’s a bye week for the Pats) and a free Sunday means we may go do something fun. Perhaps a museum, perhaps a drive somewhere pretty. Or we may just hang out at home and watch Homeland snuggled up on the couch. Either way I doubt there’s a roast chicken in my future despite what that picture may lead you to believe. If I were making a roast chicken, though, I would make it just like that one – in a cast iron fry pan with onions and lemons shoved up the chicken’s unmentionables along with fresh rosemary surrounding it for flavor and aroma. My mouth is watering just thinking about it because nothing screams Sunday supper like the smell of a roasting chicken. I love roast chicken too! I use garlic and no onions, but for sure the lemon (in the same place 🙂 and sadly, I don’t have a cast iron pan. I will likely be having chicken soup (again) for dinner tonight. Marc made the best batch yesterday in the crock pot. Maybe I’ll blog about that! I have absolutely no idea what is for supper! And no cast iron pan. But, roast chicken is #1 and the Rosemary – key. Enjoy wherever your day takes you! I always use a cast iron pan, too, preheated in the oven at 450, using Mark Bittman’s recipe. Any leftover gravy (simply from the wine deglazed pan) are made into ice cubes. Last night I extended some spaghetti sauce with one and it was fabulous. Haven’t decide on what to make tonight, yet. I usually sprinkle salt and pepper in the cavity before shoving rosemary and half of a squeezed lemon up it’s unmentionables. No cast iron pan, but in a Le Creuset dutch oven with scattered garlic around the bird. Bake in the oven with the top on for 45 mins. I take the top off for the last 20 mins of cooking for a crispy skin. I use the carcass for homemade chicken broth the following day. I may make pork stew with grilled tomatillos for dinner tonight. Have quite a few left over from a bushel I bought and they have lasted well in the fridge. 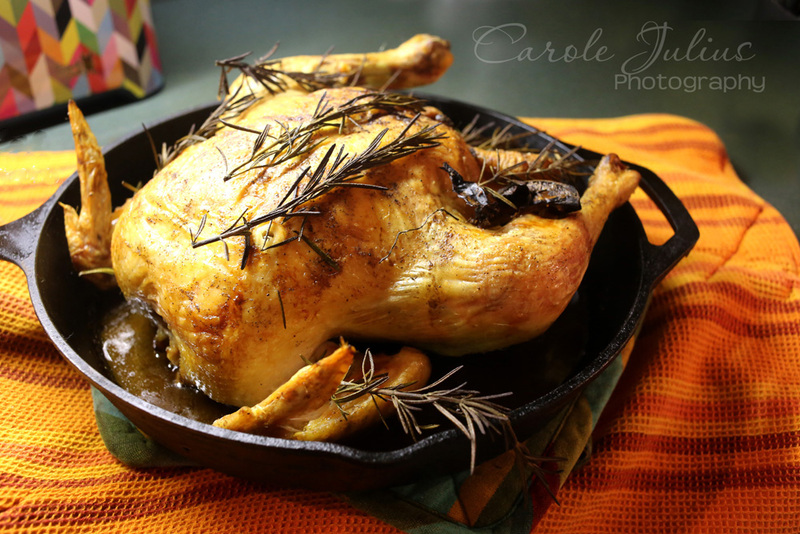 I’ve been craving roasted chicken and love the idea of making it in a cast iron skillet. However, a restaurant we like has a very good rotisserie chicken and we might go out tonight instead of messing about on our own! Next time, I’m going to try your method! Have a great Sunday! Maybe your Saturday adventures will result in a blog post story. Maybe not. But the picture of the chicken is delectable. That photo looks like it’s from the pages of Bon Appetit! Family relationships are always fascinating. One of my sister’s best friends is her husband’s first wife and I always find this interesting, possibly dangerous, yet practical as it makes family celebrations much easier. Hope your renewed bonding was fun. Love your description of how you’d prepare the chicken! Unmentionables indeed. I bought some live clams this morning, and will be making clams with linguine tonight. I hate bye weeks. Love sisters-in-law or sisters-out-law! I’ve got a brother-in-law that calls himself and me the outlaws…yea, he’s pretty cool! Roast chicken is great at this time of year. We had leftover baked ziti from Saturday night. I love it when a meal lasts a couple of days!